What is the curriculum for IGCSE at Manchester International School? Commerce Stream: English; Mathematics; French/Hindi; Accounting; Combined Sciences; Economics; Information Technology. Why has MIS selected specific subjects only for IGCSE? Manchester International School has selected the most popular subjects for IGCSE that meet the eligibility for higher studies in India. Does MIS offer other subjects for IGCSE? Manchester International School allows its students to appear for other subjects in their individual capacity. However, coaching for additional subjects will be provided only if there are minimum 7 students opting for the same. What exams of CIE are conducted by Manchester International School? When are the IGCSE Board examinations conducted at Manchester International School? 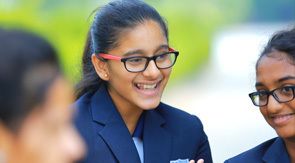 At Manchester International School, IGCSE board examinations are held in the month of March. However, school may consider permitting students to appear for June exam at their own discretion. We appreciate that our IGCSE students will continue at Manchester and follow the AS and A level Programme in classes XI and XII. They can also opt for A level programme in any other International school that offers the same. IGCSE helps the students to develop key learning, problem-solving and investigative skills by encouraging an active, critical and questioning approach to study. With a choice of Core and Extended papers in most subjects, the IGCSE is suitable for students with different levels of ability. Hence it is wrong to say that results of IGCSE are stricter than SSC. However, we agree that the SSC students are granted marks very leniently including internal and sports marks. But all reputed colleges have accepted IGCSE and students are admitted for HSC. Even IGCSE students are allowed to fill online application form for HSC admission in many states. Is the best of five policy applicable to IGCSE students? When are the Checkpoint exams held at MIS? What curriculum is followed in the Pre-primary level at MIS? Manchester International School follows an indigenous Preprimary curriculum based on the ideas, theories and practices prevalent internationally to develop the multiple intelligence of students such as cognitive and motor skills. Through each unit of inquiry, the students' curiosity and imagination is sparked by exposing them to a new world of “Discovery with Action”. What curriculum is followed in the Primary level at MIS? MIS follows an integrated curriculum in the Primary. The Primary Programme covers the core subjects of English, Mathematics and Science, developing essential skills in literacy, numeracy and scientific enquiry while covering a good knowledge base. While at the periphery, the students receive instruction in the national language, Information technology and creative art, thus completing the continuum of holistic development. What curriculum is followed in the Middle School at MIS? The Middle School /Checkpoint curriculum at Manchester International provides natural progression from Primary and develops children's knowledge and skills in Mathematics, English and Science. We offer the core subjects - English, Math and Science as per the curriculum framework given by the CIE. Checkpoint text books recommended by CIE are used for the purpose. Students' language skills are further enriched through training in national and foreign languages like Hindi and French. The Social Studies are also taught, the emphasis is on developing students' understanding of their environment and deepening their reverence for rich geographical wealth and the glorious historical heritage of our country. Students are further equipped with technical skills through the study of Information and Communication Technology. Cambridge Checkpoint exam is taken at the end of Grade VIII. Since when are students trained for Cambridge pattern of examinations at MIS? At Manchester International School, students are trained for Cambridge pattern of examinations right from Grade 1 onwards. All worksheets, question papers are designed as per Cambridge pattern so that students get used to solving application based questions. What are the subjects offered for A level at MIS? Commerce Stream : English; Math; Accounts; Business studies; Economics, Information Technology. Science Stream : English; Physics; Chemistry; Math/Biology, Information Technology. Each subject that a Cambridge international student takes at AS and A Level receives a separately certified grade. From 2010, the Cambridge International A Level is reported on a grade scale from A* grade, awarded for the highest level of achievement, to E, indicating the minimum required performance. There is no A* grading in the certification of Cambridge International AS Levels, which will continue to run from Grade A to Grade E. There is no core paper in AS and A level. How are the teachers trained to teach CIE qualifications at MIS? What are the future plans of MIS? Manchester International School will shortly introduce Cambridge Entrepreneurship program for its students. We also aim to introduce NIOS board exams shortly for students with learning difficulties. When do students start and finish the PYP? When do they transition to the IGCSE? The PYP is designed for students aged 3–12 (preschool and primary grades). The IGCSE spans students aged 11–15, and the AS / A levels is for the last two years of school for students aged 15–19.